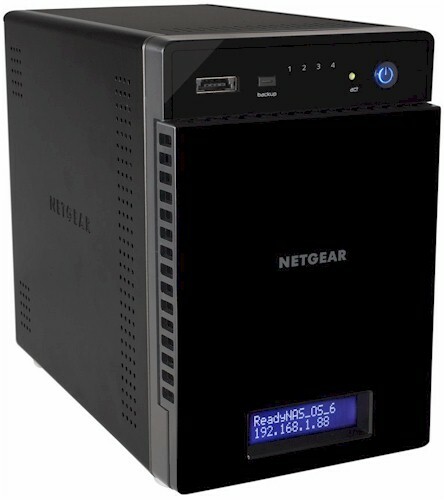 In June, we reviewed NETGEAR's dual-bay ReadyNAS RN202. Earlier this month, the company rolled out a higher-performance RN21X line, in the form of the ReadyNAS RN212 and RN214. The main difference between the RN20X and RN21X is the move from a dual-core Annapurna Labs processor to a quad-core version. For this review, NETGEAR shipped us the four drive RN214. Though the main boards are different between the RN212 and the RN214, NETGEAR assured us that using the RN214 with only two disks properly reflects the performance of the RN212. The processor and memory is the same for both units. Our review unit was the diskless model. However, for the RN212, NETGEAR also offers a 4TB version (2 X 2TB) and a 6TB version (2 X 3TB). 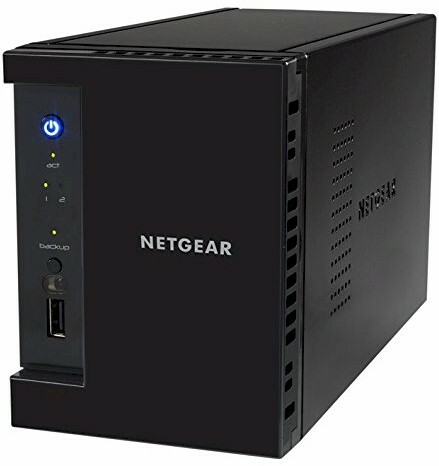 For the RN214, in addition to the diskless version, NETGEAR offers the following models: 4TB (2 X 2TB) a 6TB (2 X 3TB) 8TB (4 X 2TB) and 12TB (4 X 3TB). Both NASes will work with 6 TB disks bringing the total "raw" storage up to 12TB (RN212) and 24TB (RN214). For this review, I've chosen two other NASes to compare with each of the RN21X models. For the 2 drive RN212, I'll be comparing it to the ReadyNAS RN202 and ASUSTOR AS5002T. For the 4 drive RN214, I'll be using the ASUSTOR AS5104T and QNAP TS-453 Pro Turbo NAS. These same products will be used throughout the review for key component, benchmark summary and ranker performance comparisons. The callouts below were taken from the latest hardware installation guide. The RN214, like the RN204, has a status display screen. The two drive versions rely solely on LEDs to display status. There is an error on the RN214 callouts - the front panel port is a USB 3.0 port. All ReadyNAS RN2XX NASes have three USB 3.0 ports and no USB 2.0 ports. The image below shows the rear panel callouts for both RN21X NASes. Both NASes have the identical port complement consisting of two Gigabit Ethernet ports, eSATA port, reset button, Kensington lock slot and power adapter socket. The chart below shows the LED indicator descriptions. The only real difference is that the RN214 has a Status display screen and additional LED indicators for the additional two bays. The Gigabit Ethernet ports have two status indicators. One shows link and activity. The other shows link speed (green=1000 Mbps; yellow=100 Mbps, off=10 Mbps). The image below shows the main board. The heat sink on the processor in the center of the board has been removed for the photo. Disassembly of the unit was somewhat complicated by the use of silicone caulk to glue the fan connector to the drive backplane. The drive backplane had to be removed in order to slide the board out for inspection. Table 1 below shows the key components for the two bay NASes used throughout this review for comparison. Table 2 below shows the key component for the four bay NASes used throughout this review for comparison. Note that all three four-bays have quad core processors. With two WD Red 3 TB (WD30EFRX) drives active, the NAS drew 18 W; with four drives active, it drew 26 W. The drives did not go into power save mode after the programmed time, even with the Ethernet cable removed. Noise with both two and four drives was rated as low. A RAID 1 rebuild and sync (2 X 3 TB) took 6 hours and 40 minutes; four drive RAID 5 volume rebuild and sync took about an hour longer. Changing RAID levels was a challenge since it appears the volume manager prefers absolutely virgin drives. Fortunately, most users won't change between volume types as often as we do for testing. The RN214 is running an updated version of ReadyNAS OS6. I reviewed ReadyNAS 6.0 when it was originally released in mid-2013 and again last December when Version 6.2, a major upgrade, became available. In early October, NETGEAR released OS 6.4 - the version used in our performance testing. To see what's new, you can check out OS 6.4 release notes. Unfortunately, NETGEAR doesn't have an online emulator, so you can't experience the UI for yourself. To give you a feel for ReadyNAS, here's a screenshot from my RN104, which I upgraded to OS 6.4. The landing page looks virtually identical to Version 6.3.4 that was used in our previous review. ReadyNAS OS 6.4.0 firmware was loaded onto the RN214 review sample and performance tests run using the Revision 5 NAS test process. Since the RN214 uses the same processor, RAM and Ethernet components as the RN212, all testing was done on the RN214. The RN214 tests used four drives configured in single RAID 0, 5 and 10 volumes. The RN212 tests used two drives in single RAID 0 and 1 volumes. All tests were run using Western Digital Red 3 TB (WD30EFRX) drives loaned by WD. The composite image below shows how the RN212 and the RN214 compare to other products for File Copy Write performance. The File Copy Write test for both NETGEAR ReadyNAS NASes turned in similar scores, but both slightly lower than the top-ranked products showing ~ 110 MBps. Note that quite a few NASes in both charts are clustered around 110 MB/s. That's about the maximum throughput that you can achieve with single client Gigabit Ethernet testing. As we have noted in other reviews, performance within 5% is treated equally by the NAS Ranker. For the two drive comparison, I chose the NETGEAR RN202 and ASUSTOR AS5002T. The benchmark summaries below shows file copy write and read performance was above 100 MB/s for both RAID0 and RAID1 for all products. All three products turned in similar performance results on most NASPT benchmarks. Interestingly, the dual-core RN202 outperformed the quad-core RN212 on some of the individual tests - most notably the NASPT RAID1 HD Playback & Record. For backup, we could only test eSATA and USB 3.0 as both ReadyNAS NASes lack USB 2.0 ports. In general, the ASUSTOR AS5002T had better backup performance than either of the NETGEAR NASes - especially for the Network Backup and iSCSI write and read tests. The NAS Ranker, filtered for RAID1 and Revision 5 testing shows the RN212 ranked #6 for performance. The other two products in our comparison both earned a better ranking and were cheaper than the $330 RN212. The ASUSTOR $306 AS5002T ranked #2 and the $281 RN202 ranked #3. Also less expensive with a better ranking, but not included in our side-by-side comparisons, was the $305 QNAP TS-251 Turbo NAS. The chart below shows individual and category scores for the same three NASes used in the two-drive benchmark summaries above. The category scores show the ASUSTOR 5002T outperformed both of the NETGEAR NASes in every category except for Mixed Read Write. The quad core RN212 trailed its dual core sibling in three of the six categories (Write, Read and iSCSI) and tied with in two categories (Video and Backup). The only category win for the RN212 was Mixed Read Write. Keep in mind, however, the differences were minor for the most part.